Jamie Foxx | No Chic. Just Geek. One of the things you occasionally hear people suggesting, when it comes to films, is that some of the famous old stories that have generally proven to be bankers time and time again – you know the sort of thing: Sherlock Holmes, Dracula, Tarzan, King Arthur – seem to have fallen out of favour, at least slightly. It’s not that they always flop, goes the theory, but they’re seldom world-conquering smash hits any more. Nevertheless, people still keep making films based on these stories, even if it is the result of some sort of reflex action: we’ve had two big-budget Sherlock Holmes so far this century, with another on the way (even if it is a spoof); a rather poor Dracula a few years ago; and two King Arthur films since 2004 (the Clive Owen version, which suggested the famous king was a Romano-British soldier, and the Charlie Hunnam one, which presented him as a kung-fu fighting London gangster superhero). And now we are on our second Robin Hood film in not much than eight years (the last one being the Russell Crowe-Ridley Scott collaboration which seemed to get considerably less interesting between the time it was announced and its actual release). The new film is (once again) Robin Hood, directed by Otto Bathurst. Now, I am generally well-disposed to an adventure movie in the classic style, even if the story is somewhat well-worn. 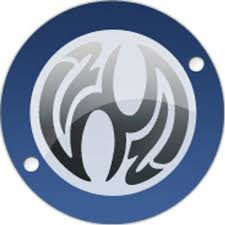 However, I suspect that even if I had managed to get to the screening of the new film without encountering the trailer or advertising, my expectations would have been flattened like a tax-collector hit with a quarterstaff by the opening dialogue alone. ‘I could tell you what year all this happened,’ says the blokey voice-over, ‘but I’ve forgotten. I could bore you with the history, but I won’t.’ Yes, God forbid you should credit the audience with any intelligence or attention span, writers of Robin Hood, just patronise away. It really does sound like the makers of the movie getting their excuses in first. I can understand why, for what the film-makers manage to do is take possibly the most famous of English historical folk-legends and – well, I was about to say that they make a film totally devoid of historical content, but this would not be true. There is lots of history in Robin Hood. It is all just mind-bogglingly, preposterously inappropriate history. Things get under way with them setting up the romance between good-hearted young nobleman Robin of Loxley (Taron Egerton, who has turned into a serviceable enough leading man) and rebellious young working-class girl Marian (Eve Hewson, who is all heavy eyeshadow and embonpoint). However, their idyll is shattered when Robin receives his ‘Draft Notice’ in the post from the Sheriff of Nottingham (Ben Mendelsohn), sending him off to fight in the Middle East. Here we have our first two bits of history – the ‘draft letter’ scene, which could quite easily come from midwestern America in the late 1960s, and the Sheriff’s full-length grey leather trench-coat, which rather leads one to assume he is serving in the Wehrmacht, circa 1940. It gets better (by which I mean it gets worse). Robin is supposedly serving in the Third Crusade (1189-1192), but the conflict is deliberately presented in a manner designed to create associations with the occupations of Iraq and Afghanistan, rather more recently – it is the same vicious chaos of house-to-house fighting. Swap out the longbows for assault rifles and stone throwers for air support and the sequence would be utterly indistinguishable from something contemporary. Robin soon learns that the Sheriff is manipulating the war in Arabia for his own ends (apparently Nottingham is ‘the beating heart of the Crusades’), soaking the poor and spreading dark, divisive tales of multitudes of freedom-hating killers intent on infiltrating western civilisation. He and John resolve to stop it, but this involves discovering what the Sheriff is really doing with the money he takes from his subjects as taxes. They adopt a two-pronged approach – by day, Robin will be a charming young nobleman who will slowly gain the Sheriff’s confidence. But by night he will be a bow-slinging robber known only as the Hood! I don’t especially want to labour this point too much, because (as mentioned) the film-makers do make it absolutely clear from the get-go that they couldn’t give a stuff about historical accuracy, but, short of proceedings halting for a musical number where Jamie Foxx delivers a new version of his 2005 meteorological ick-fest Storm Forecast, it’s hard to see exactly how this film could become any more divorced from things that actually happened in English history. One of the plot drivers is the question of what the Sheriff is up to with the cash, and I honestly would not have been entirely surprised to learn he was secretly building tanks or robots, because it would have been much of a piece with the rest of the film. Even so, you have to be somewhat staggered by something passing itself off as a Robin Hood film which features no sword-fighting, no band of Merry Men worthy of the title (there are various characters with similar names, but almost without exception they bear no resemblance to the ones from folklore), and in which you only hear the word ‘Sherwood’ and get a close-up look at a tree in the last five minutes before the credits roll. Prior to this the film is just a generic cod-historical action runaround, most obviously influenced by various computer games and superhero movies and TV shows. I suppose the big question when one chooses to revisit a fable like this one, if one has any kind of artistic soul, is why you are doing so, given there have been so many previous versions. What is the Robin Hood legend actually about? Why has it endured, and why does it continue to resonate? For me, the legend in its purest form is about a number of things – the complex nature of English society, the relationship between the people and the land, and the national inclination towards independent thinking and natural justice. If the new version of Robin Hood is about anything beyond special-effects set-pieces, Taron Egerton looking soulful, and Ben Mendelsohn yelling ‘I’ll boil you alive in your own piss!! !’, then it appears to be a sort of glib, one-size-fits-all anti-capitalist and anti-establishment propaganda. Parallels between the situation in the film and recent events are drawn in with broad, clumsy strokes – young people are sent off to die in a foreign war puppeteered by wealthy old men at home, the poor are screwed over by the economic system, and corrupt leaders cynically employ divisive and racist rhetoric to maintain control over the masses. You could, I suppose, have introduced some of these themes into a Robin Hood movie, if they were handled with care and delicacy, and inserted as a subtext. But here, the whole film feels like a cack-handed attempt at allegory – not so much Robin Hood as Occupy Sherwood. I will try to find something nice to say about this film, beyond simply that it is not quite as bad as Peter Rabbit (I still had my head in my hands at various points, though). Well – much of it is quite well-staged, and competently organised. I suppose the production values are quite good, although the costumes and sets bear no relation to any particular point in history. Ben Mendelsohn does his best as the Sheriff (too many of the supporting cast are simply wooden). The plot sort of hangs together, on its own terms. But that’s about it, really. The Rabbit comparison is a pertinent one, actually: in both cases, a well-known tale (or body of tales) has been comprehensively gutted of anything resembling the traditional content, in favour of something which the makers presumably think is contemporary, ‘street’, and edgy, but all the charm and texture of the original has been lost in the process. 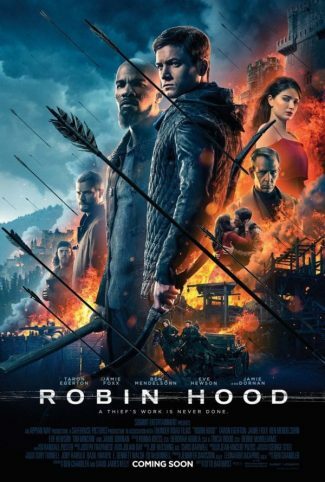 This is, by any rational standard, an awful Robin Hood film. It will probably make a lot of money. But give me Michael Praed any day. When is a Marvel movie not a Marvel movie? When it isn’t made by Marvel Studios itself, but by someone else who bought the rights to one of the company’s characters many years ago. It has been wisely observed that one of the things that makes Marvel Studios’ achievement in building up its world-conquering franchise-of-franchises so remarkable is that it has done so without access to Marvel Comics’ most popular characters – 20th Century Fox have the film rights to the X-Men and the Fantastic Four, while Sony owns Spider-Man (for some reason Universal have hung on to Sub-Mariner and Lionsgate to Man-Thing despite neither seeming particularly keen to make a film about them). Marvel have built their empire with characters who are, comparatively, second-stringers. This achievement has not gone unnoticed by the people who do own the rights to Marvel’s big-hitters, and it appears to be affecting how they make their own movies. You would have thought another decently-made instalment in the Spider-Man franchise would essentially be a licence to print money anyway, and this is basically what Marc Webb’s The Amazing Spider-Man 2 is. 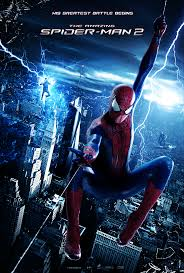 The sequel finds Peter Parker (Andrew Garfield) juggling his self-appointed responsibilities as Spider-Man with his relationship with winsome girlfriend Gwen (Emma Stone). He is constantly aware of the danger he may be putting her in, having already got her dad killed in the first film. He is also still trying to solve the mystery of his parents’ disappearance. As you can probably see there is a lot going on in this film: possibly even a bit too much. Then again, one of the distinctive things about Webb’s take on Spider-Man is just how many things are turned up to eleven – the colours are brighter, the CGI more elaborate, the emotional content more overwrought, the plot more crowded. Just about the only thing that gets soft-pedalled is the humour and quirkiness, but – as with the first film – I suspect this is more born from a need to be different from Sam Raimi’s Spider-Man trilogy than anything else. That seems to be slightly less of a concern this time around. While the appearance of Electro might indicate this run of films is intent on excavating the lower reaches of Spider-Man’s rogues gallery, the movie also includes a new version of the Green Goblin. They still shy away from creating their own version of J Jonah Jameson, though. And there’s an extent to which they’re on a hiding to nothing with this approach, anyway: you can’t properly do Spider-Man on film without including plotlines about his difficult lovelife, so this film inevitably recalls the Raimi ones in that respect. On the whole it is a fun and entertaining package: what it lacks in narrative focus it makes up for in colour and incident. Garfield and Stone are engaging leads, even if I didn’t find their scenes together to be as irresistibly cute as the director clearly did. The pathos of the Electro character is a bit undermined by Foxx’s tendency to go OTT, plus the character’s origin (he is basically savaged by a shoal of electric eels) – well, it’s possibly not the silliest origin story in the history of superhero movies, but it’s definitely high on the list. Dane DeHaan (possibly cast on the strength of his performance as a supervillain-in-the-making in Chronicle) is really much better as the new Goblin. It’s very hard to see this as anything other than an attempt to replicate the success of Marvel Studios’ model of putting out at least one film a year, but whether they can do so from such a narrow base remains to be seen: especially if, as is apparently the case, on-screen crossovers with the Fantastic Four have been ruled out. This kind of film has always been made with one eye on potential sequels – but now it seems that building a franchise is starting to take priority over the quality of the actual film. That’s something that the producers of the Spider-Man series might want to bear in mind in future – for the time being, The Amazing Spider-Man 2 is an entertaining film that ticks all the boxes for this particular character – it’s just a little too preoccupied with Spider-Man films of the past and future to really be something special itself. Slim pickings down the cinema at the mo’, if you ask me – so this week I was planning to go and see Ain’t Them Bodies Saints at the local Picturehouse. However, I had reckoned without the cinema’s surprising entry policy for some of its daytime screenings, namely that you need not only a ticket but also an infant child in order to get in. Being unable to lay my hands on a toddler in time, I was faced with a bit of a quandary: go and see something I really didn’t have any particular interest in, or not see a film at all this week? Well, obviously I decided to go after all, and after surveying the film times the best fit for my schedule proved to be White House Down (beating out Diana and R.I.P.D., in case you were wondering). In the past I’ve gone on about how day-and-date releasing is now standard industry practice. When a major movie doesn’t get a simultaneous global release, and especially when a summer movie gets pushed back into the autumn, one is inclined to start smelling something a little funky. White House Down came out in the States nearly three months ago but is only now troubling British cinemas. Roland Emmerich’s film is – well, look, here’s the plot, see what you think. Reliable beefy lunkhead Channing Tatum plays John Cale, a vaguely-blue-collary cop with family issues – nothing at all like John McClane, vaguely blue-collary cop with family issues, right? – working in Washington DC. He wants to join the Secret Service and to that end toddles along to the White House with his young daughter, who is a monumental civics nerd and expert on the place, not to mention the American constitution. So it is, basically, Die Hard in the White House, which is fundamentally a silly idea for a film. This is not White House Down‘s biggest problem. You may recall that earlier this very year we were treated to GERARD BUTLER!!! (imagine me shouting that in a Scottish accent) in Olympus Has Fallen, a thriller which was basically Die Hard in the White House. 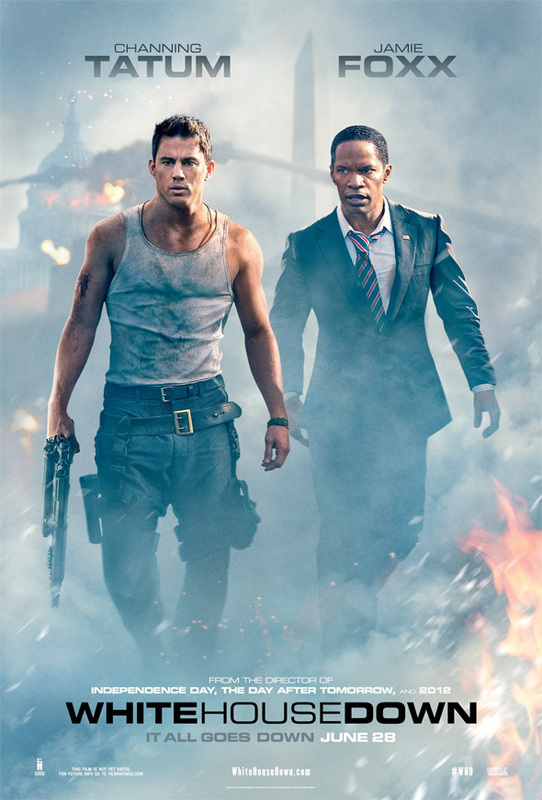 So White House Down isn’t just silly, it’s silly in a way which doesn’t even seem very original. I get the impression that James Vanderbilt, author of the script, has watched Die Hard itself many, many times, as pretty much every beat and reversal of that film gets painstakingly revisited here. Okay, I exaggerate, but you’re never in any doubt about how the story is going to unfold. The identity of the White House traitor is blazingly telegraphed from his first appearance (it’s James Woods, in case you were wondering), Cale is initially given a frosty relationship with his daughter so the moment when she starts hugging him and calling him Daddy has some impact, the white-collar Secret Service types are all snotty about him to begin with so he can be especially smug when he starts saving the day, and so on. The thriller aspect, though polished, is terribly mechanical and familiar. The political aspect of this film, inasmuch as it has one, is very much in line with the way that the US President has been depicted on screen for the last two decades. If you look at Hollywood movies and TV from the mid to late 90s, it’s striking how they come across as thinly-disguised love letters to Bill Clinton: we get the Prez impressing everyone with his wit and humanity (The West Wing), wowing the ladies as romantic lead (The American President), personally punching out terrorists (Air Force One), and even jumping into a fighter jet to lead the resistance to an alien invasion (Emmerich’s own Independence Day). Hollywood loved Clinton. The Bush years, on the other hand, transformed the President into a nonentity who died off-screen (Emmerich again, in The Day After Tomorrow) or was cuckolded by the hero (The Sentinel): generally a rather less heroic figure. Now we find ourselves in the Obama era, obviously Hollywood likes the President again, although not as much as they did Clinton: Foxx here is obviously a good guy, but he still has to be looked after by Tatum’s character. One does get a sense of a bit of a tension at the heart of this movie between its desire to be a credible political thriller and its need to tick the popcorn blockbuster boxes. There’s some interesting stuff about the constitutional chaos that ensues when the President himself is MIA, and various FBI, army, and Secret Service types squabble about who’s actually in charge – but the film can’t afford to spend too much time on this sort of thing and soon enough we’re back to the galloping, uproarious absurdity of a car chase round the White House garden with the President shooting a rocket launcher out of the window of his own limousine. So there’s two films going on here, one rather more developed than the other. I would happily have watched either the serious, crisis-of-command one, or the preposterous crowd-pleasing President-with-a-bazooka one (although I suspect I’d have preferred the former). The thing is that putting them together, even as competently as Emmerich does, is a bit problematic. This is a film which is about terrorism and touches on genuine issues in world affairs. To do so and then include dumb visual jokes and moments of utter, unbelieveable cheesiness just seems incredibly facile and in very dubious taste. There’s a scene where a gun is put to the head of a crying child, which isn’t really something I’d expect to see in a proper, inoffensive popcorn blockbuster. So this is a film which is not without moments of interest and entertainment: Jamie Foxx gets some funny lines as the Commander in Chief, Maggie Gyllenhaal is reliably good as someone stuck on the outside trying to take charge of the situation, and James Woods and Richard Jenkins give the sort of reliable support you would expect from them. But the basic set-up remains very, very familiar, and the film is so all over the place in terms of its tone that’s almost impossible just to detach your higher functions and enjoy it as a piece of cheesy fun. Emmerich marshals the proceedings with his usual aplomb, but White House Down is by no means one of his best films. Faint echoes of both The Terminator and Speed reverberate through Michael Mann’s Collateral, which features an always-welcome appearance by one of this column’s favourite leading men. Unfortunately, Jason Statham is only in the movie for about a minute, as the director has (for reasons best known only to himself and the massed moviegoing public) decided to give the lead role in his latest thriller to some schmuck called Tom Cruise. Collateral is a return to territory, both physical and narrative, that Mann has visited before. It’s a Los Angeles-set crime drama revolving around a masculine battle of wits. On this occasion the combatants are Max (Jamie Foxx), a cab driver who’s been on the verge of doing something with his life for the last twelve years, and Vincent (Cruise), a contract killer he is unlucky enough to pick up as a passenger. Vincent has five stops to make in the course of the night and decides to get Max to chauffeur him around between them. Originally this is done purely through financial incentives, but once Max rumbles what Vincent is up to (his first target is unhelpful enough as to fall out of an apartment block onto the roof of Max’s cab) sterner measures are in order. Will Max get through the night in one piece? Will Vincent complete his hit list? Will the LAPD (unstandably alarmed by the trail of corpses the pair leave in their wake) figure out what’s going on and get involved? One thing’s for sure: it was never like this in Carry On Cabbie. As one would expect from the director of Manhunter and Heat, this is a tautly-directed movie with barely an inch of fat on it. It’s built around a neat central idea but for all that I suspect screenwriter Stuart Beattie had to work horribly hard to flesh it out into the credible and complex story this film tells. Only in a few places does it seem contrived or improbable (for instance, at one point Vincent decides he and Max will visit Max’s elderly mother in hospital). It’s expertly paced, mixing hard-edged action with much longer, almost laid-back sequences of the cab just cruising nocturnal LA. The city has seldom looked so beautiful on the big screen, for all the darkness of the story… The cinematography is gorgeous, digital cameras and conventional film meshing nearly flawlessly. But while the movie looks great your attention never wanders too far from the lead characters and their slightly peculiar relationship. 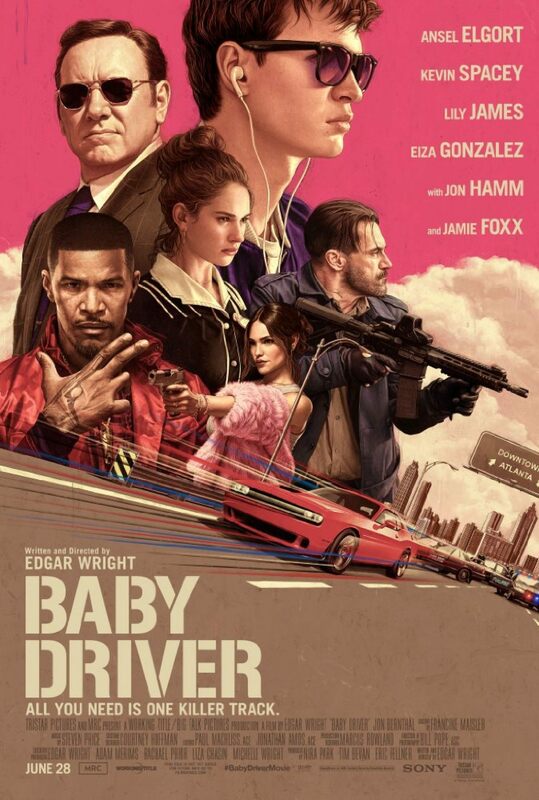 I must confess to being unfamiliar with Jamie Foxx before this film but he does a very fine job here as a regular person who gradually realises exactly how far over his head he’s ended up. He is, however, inevitably overshadowed by Tom Cruise, who gives his best performance in quite some time. It would, of course, make perfect sense for Vincent to put a bullet in Max’s ear the moment he realises what’s going on, and so in order for the movie not to be half an hour long and quite depressing the assassin is written as a man with a deeply skewed but still binding moral code. Not only does he keep his reluctant companion alive, he even attempts to give him personal and career advice, and seems rather offended when his help is rejected. This injects some welcome humour into what’s quite a taut and grim story, and allows Cruise a chance to shine. For once all the smarm and narcissism doesn’t get in the way of the performance, and he’s very effective indeed in portraying a man who, on the face of it, seems almost non-descript, but is underneath is deeply psychologically flawed. To be honest, when the two leads aren’t in the taxi, and especially when they’re apart, the film has a slight tendency to drift, but not enough to spoil it. The climax is a tiny bit identikit-action-movie fodder and the final showdown inevitably seems a bit implausible. But on the whole this is a hugely impressive movie, a strong candidate for thriller of the year.